Bulk Composition : Fe = 89.9 ± 0.3 Ni = 9.0 ± 0.2 P = 0.62 ± 0.02 Co = 0.51 ± 0.01 (all wt.%); Ge = 41 ± 4 As = 26 ± 5 Ga = 19.1 ± 0.5 Pd = 5.1 ± 0.2 Au = 2.6 ± 0.2 (all µg/g); Ir = 43 ± 4 ng/g. Oxygen Isotopes δ18O = 2.569‰, δ17O = 1.179‰. MORE MY STONY-IRON METEORITES - Pallasites Click Here! This specimen is full of beautiful olivine crystals embedded in a mirror-like nickel-iron matrix! Here is an opportunity to add a beautiful part slice of Imilac Pallasite to your collection! Stony Iron Meteorite - PallasiteThree specimens are all very nice pallasite slices. 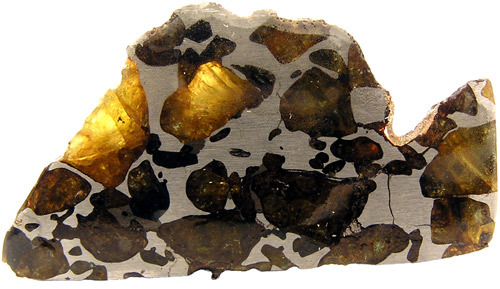 The meteorite is a textbook example of a transitional pallasite.